Governor Patrick had some choice words for MBTA General Manager Dan Grabauskas this morning. 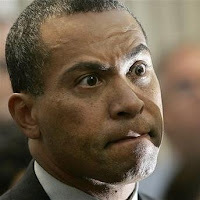 Discussing his performance at the MBTA, Patrick told the Globe he was concerned with, “the competence of the leadership and the adequacy of the management.” That’s funny, because that is exactly what most people would say if asked about Governor Patrick’s performance in the corner office. The lack of leadership, the incompetency when dealing with the economy and the arrogance Governor Patrick and his administration have exuded since his tenure began are just a few, among many reasons why the Commonwealth needs a new leader. Charlie Baker couldn’t have entered the Governor’s race at a better time. While Governor Patrick is playing politics as usual by trying to oust a high ranking official that differs with his agenda, the Commonwealth is dealing with a revenue free fall. At the same time, the Governor and the Democrats in the Legislature are spending millions of dollars the state doesn’t have. We need new leadership in the corner office and Governor Patrick is helping make the case for why the state deserves better.